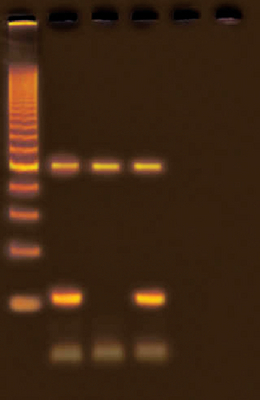 DNA variants between wild and mutant Drosophila are amplified and analyzed using agarose gel electrophoresis. The amplified DNA from these wild-type and white-eyed flies are a simple and accessible way to demonstrate DNA polymorphisms to students using practical applications for future genetics study. Kit includes PCR beads, primers, DNA extraction buffer, 200 bp ladder, Proteinase K, Drosophila (wild type and white eye), agarose, electrophoresis buffer, FlashBlue™ stain, and activity instructions. Coupon is included for redemption of live materials. Requires a thermal cycler, electrophoresis apparatus and power supply, automatic micropipette with tips, microwave, water bath, UV transilluminator, and microcentrifuge. Materials supplied for ten student groups. Time requirements: Set up: 30 min. ; PCR: 2 hours or overnight; Electrophoresis 90 min.